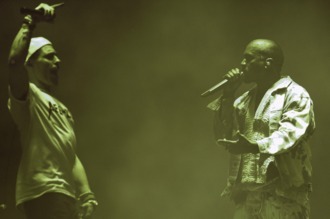 The comedian who invaded the stage during Kanye West’s headline slot at Glastonbury has said he wanted to "give him a hand". Simon Brodkin, 38, who is best known for his antisocial character Lee Nelson, ran onstage wearing a "Lee-zus" T-shift and carrying a mic during "Black Skinhead", the fourth song of West’s set. His actions disrupted the song and West was forced to restart the track after Brodkin was apprehended by a security guard. Tweeting from his Lee Nelson account, he wrote: "Some people were saying Kanye shouldn’t headline Glasto so I thought I’d give him a hand."